Gregory R. Coker | Reaching New Heights Foundation Inc. In September 2013, after 26 years of honorable and distinguished service in the United States Army and Army Reserve, Sergeant Major Greg Coker founded the Reaching New Heights Foundation Incorporated, during his anticipated transition to a purposeful and fulfilling civilian life. During his life journey, Greg, a proactive problem-solving advocate, has always eagerly focused on being a willing servant to others. 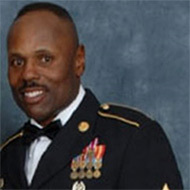 Arriving home in Southern California, Greg immediately took on the challenges of assisting and mentoring Inland Empire military veterans seeking respectable housing within their communities, seeking vocational training, and seeking meaningful employment and assimilation into contemporary civilian America. Greg believes that the truest legacy of this foundation’s success will be the Veterans’ lives that are changed, and the communities that are enriched. Greg believes that generous philanthropic funding is critical to sustaining the foundation’s goals for these transitioning veterans. Greg believes that significant successes may be achieved via the collaboration of community-service organizations, and the power of heart-felt volunteerism. Greg believes that his rare career paths of entrepreneurial salesmanship and structured military service have intertwined over time, centering him, and providing balance for his sense of personal accountability, his innate yearn to serve as a connector, his transparent ethics, and his energetic leadership-by-example style. These admirable traits have become the cornerstones of the Reaching New Heights Foundation. During 1987, Greg began his civilian career as a telemarketer with the Xerox Corporation, before progressing thru several assignments to become an award-winning Account Executive there. His business knowledge, savvy salesmanship, responsibilities, and successes grew further with Johnson & Johnson Pharmaceutical Companies, Allscripts, and Vision Quest Orthocare, while simultaneously serving in the United States Army Reserve in a series of increasingly-responsible leadership assignments. His military career’s culmination assignment was recently serving as the Operations Staff Sergeant Major for the 5th Armored Brigade stationed at Fort Bliss in El Paso, Texas. As a seasoned hands-on manager and combat veteran, Greg created relevant impact in the realms of validations/quality control, plans, operations, training, contracting, and safety. Greg was directly responsible for implementing an annual $2.5 million dollar budget, while managing the effective training of more than 12,000 soldiers deploying for combat duty. Greg was born and raised in central Ohio, and later lived most of his adult life in Southern California. He earned a Bachelor of Science degree in Industrial Technology at Central State University in Wilberforce Ohio in 1986. Greg earned a Master of Arts degree in Leadership Studies at the University of Texas at El Paso in 2013. Presently, Greg is pursuing a second advanced degree – a Master of Arts in Rehabilitation Counseling at California State University, San Bernardino, anticipating his graduation during 2017. Among Greg’s signature professional skills and strengths are: his critical-thinking strategic vision; his abilities to analyze and organize key performance indicators; his commitment to continuous improvement; his generous heart; and his effectiveness as a team-building connector. Greg takes great professional pride in successfully motivating, inspiring, challenging, and leading others toward their goals. Greg and his wife Tanya of 27 years have two daughters, Niani and Naysha.